Okay, we admit it – it's an impossible question. What is the best Video Editor App out there? I mean there are so many to choose from. 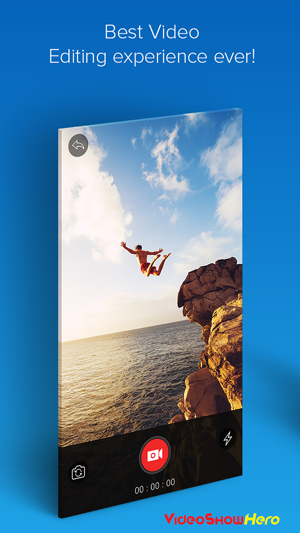 The truth is that the best video editor app for a pro videographer is a million miles from the best video editor for an adventure sports nut or even a home video extraordinaire!! 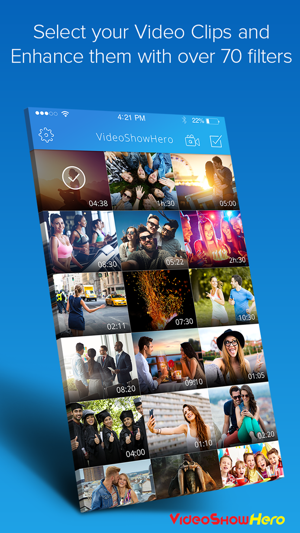 Until now…..
What we've done is created VideoShowHero, the all-in-one app dedicated to video editing that stands out among the rest. This may be because VideoShowHero has the most amazing features, filters, and uber powerful editing capabilities that keep the Videographer in mind. No longer does filming on your phone mean a compromise in quality – The HERO has arrived!! Special Note: With Musical.ly, the new social platform, create your awesome videos then import it and watch it trend!! Become the next best thing!! Trim and Merge –Cutting & merging clips has never been easier and more fun. 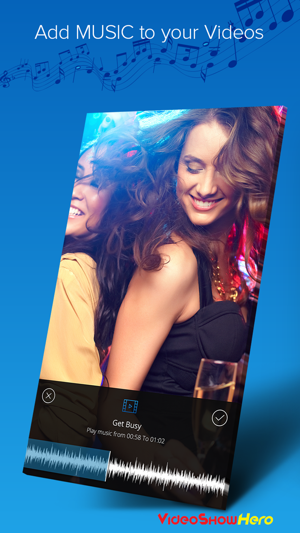 Turn your Video snapshots into a moving slideshow. Music - Overlay music from your local stash to provide the perfect soundtrack for your videos; Listen and sing along while you do it!! Text – Adding titles and captions to your video can put that professional cherry on top. Filters – Why does Instagram get to have all the fun? 70 + filters can take your videos on a journey through time. Blurr- Easily create out of focus areas in your videos and focus the attention on what really matters. 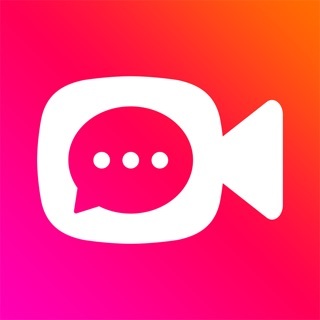 Record: Add voiceovers to make creative and awesome videos such as lip-sync, duet singing, etc. Slow Motion: Slow it down for that dramatic movie effect or Speed it up and create a beautiful time lapse of magnificent wonders. Adjust: Lighting issues? – Feel free to play with the brightness, contrast, highlights, etc. 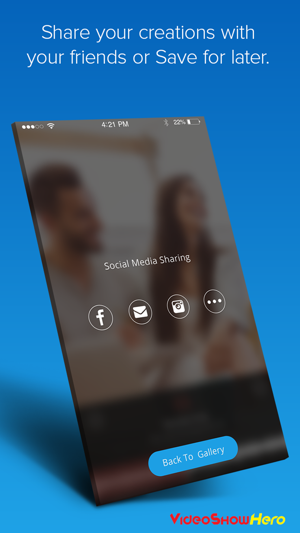 Share your Creations to Facebook, Instagram, iMessage or just save it with this all in one social media storytelling tool. Right off bat your asked to rate the app. Think about that. The app you just downloaded and are opening for the very first time, they want a review. They want a positive review before your first use because they know that once you try it out, you’ll see that it’s trash and immediately delete it. No part of the app works. You can’t edit your videos because it doesn’t allow you to open them, it just shows what’s saved on your phone. So naturally you go to settings but that is nothing more than their hiding place for the in-app purchases; no settings. The app does nothing. I tried 10 different videos from my phone, all of varying lengths, and noticed. Thank you for your review. We will be relocating the app rating popup and to the end per your experience and sound advice. Also we have worked to place our ads in better locations. Remove adds free of charge? Ads were supposed to be removed for free today as a promotional offer. App wanted to charge $0.99 for ad removal. In response to the developer’ response. I honestly don’t remember if I knew I had to go through the IAP ad removal process during the promotional period. Instructions would have been helpful, unless I missed them and then it would have been my mistake. I probably assumed like many other reviewers that purchasing the App during the promo was all that was necessary. Some reviews claim they did try the promo within the proper time frame and it didn’t work. Deleting, restarting and reinstalling shouldn’t be necessary. When you open the App you immediately get an in your face full page ad and are asked for a review. I think we can agree that before you can give an honest review you need to be able to use the App. Secondly the ad appears to push the review request partially off the top of the screen. iOS 11.2.5 has a option to opt out of requests for reviews that developers should be abiding by. If the ad removal promo is offered again I would give the App a try and leave an honest review. The promotion was only for 1 day, 02/03. Fortunately we have since extended it for our good users . so please try again. This is EXACTLY what I was looking for in a video editing app on my phone, cropping, special fx music, filters...wham bam and done. But OMG THE ADS!!! And I’m not mad at ads, I get it, you should be able to make $$$ for a good app, but you can’t close out of them, or when you can, you realize it didn’t save the work from before the effing ad popped up. When there’s an X in the corner nothing happens when you press it. Seriously, you’ve ruined a great experience. So disappointing. I need to find an identical app but without the ads. Suggestions welcome. ETA- I didn’t even know there was an option to pay to take the ads away. I can’t even get to my account settings to pay because of the crappy pop up that won’t close. Shoot me. Fix this please! !